After a recent horrible experience with my dog groomer I realized that there’s a concerning lack of local regulations, laws, and certification requirements for dog groomers in DC. Thus, there are no options for officially reporting an incident to any department solely pertaining to the protection of our furry friends. I work in the legal world of health care for people – so I was shocked to find out that a dog friendly city like DC has no laws protecting our pets from bad groomers. Reporting any complaint or incident to the DC Department of Health is – and should be – reserved for people. The form does not include anything about animals, and there are no separate forms for these issues. Additionally, even if you do file a complaint, there are no laws or requirements that they (or even our Office of the Attorney General consumer protection complaint) can enforce – making the efforts moot. Unfortunately, it took a very bad personal experience for me to discover all of this. Story continues with photo of pup (with injury) after the jump. The first time there was a very small incident – he said that she accidentally got nicked on her tongue with the scissors when he was trimming her face, and showed me where and said these cuts bleed quite a bit but they heal quickly. These things are true, and he was upfront and honest with me and it was the first incident over a long period of time so I let it go. The second time, he said he accidentally nicked her hind leg a little bit with the razor – it was very minor and more like a scrape – not bleeding, so I was alarmed but not overly concerned. I kept an eye on it, kept it clean and she healed up pretty quickly. I thought I’d give him another chance. And this third chance – was by far, the worst. 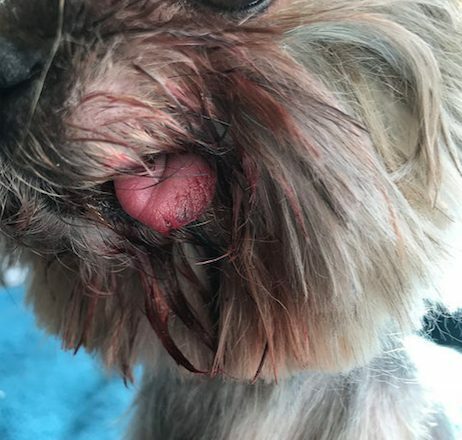 It was beyond traumatizing – which may sound overly dramatic but for any dog owner who has seen their dog in pain and bleeding all over you, I think you will understand. Per usual, he texted me that she was ready and I said I’d be there shortly. 10 minutes later, my little one is so excited to see me as usual and jumped all over my lap. I handed him cash, and went to put her harness on. That’s when I noticed that my hands and my pants and shirt were covered in blood. Covered. He said oh her tongue got a tiny cut but it wasn’t bleeding before. I was emotional and kept trying to check it, but she was panicky and just wanted to get out of there. He apologized and offered to return the money but I wasn’t concerned about that, and wanted to pay for the haircut she received and get out of there to make sure she was okay. He rinsed the blood off of my hands in the groomer sink and handed me a towel to wipe the blood off of my face (she had licked my face in excitement and there was blood all over the side of it). When we got home, I was in tears but quickly examined her injury more closely in the light and assess if she needed to go to the vet. That’s when I saw that her face and underneath her mouth was completely red with blood. The cut on her tongue – while not serious enough to go to the vet (I FaceTimed a vet friend) – was serious. There was nothing a vet could do to treat it, but I am still horrified and monitoring the slice in her tongue to ensure it doesn’t get infected. I’m not sure how it will heal or if it will heal properly – the damage might be permanent. I believe that he felt badly about hurting her. Of course, I don’t think he intended to – but the severity of the cut/slice, and the fact that he did not immediately tell me about it was so, so wrong.